Chinese engineers at Beihang Unmanned Aircraft System Technology, a part of Beihang University in Beijing, are in the process of developing a drone which will be able to fly 1,500 kilometers carrying 1 metric tonne of cargo. The design plans for the yet to be named drone, will be finalised before year's end, while the construction of a prototype is scheduled for 2019 with test flights planned for 2020, a report in the China Daily said. 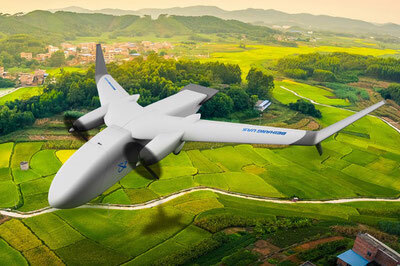 Mass production will begin if test flights are successful, and a drone-based delivery network is expected to take shape around 2025, said Zhang Shuo, chief designer at the Beihang technology company, in an exclusive interview with the state-owned newspaper. Zhang was quoted as saying that his company expects to sign a strategic partnership agreement this week with Cainiao, the logistics arm of Chinese e-commerce giant Alibaba Group, to jointly develop and market cargo drones. "We're targeting express delivery enterprises as major users of our drone because they are projected to be the largest users of commercial drones. We believe that Chinese couriers will like a powerful craft suitable for cross-province cargo delivery, especially in remote or mountainous regions or islands," Zhang said. The drone will be 11.9 metres long, with a wingspan of 19.6 m, and have a maximum takeoff weight of 3.6 tonnes. The aircraft will be powered by two engines and have 16 cubic metres of cargo space. It will cruise at 360 km/h and be able to take off and land on short, rough runways. The world's largest drone is the United States' Northrop Grumman RQ-4 Global Hawk, a military surveillance craft that is 14.5 m long and with a wingspan of 39.9 m and a maximum takeoff weight of nearly 15 tonnes. The China Daily said the country has been the world's largest express service market for four years. Couriers delivered more than 40 billion packages in the country in 2017, earning total revenue of nearly 500 billion yuan (US$78 billion), according to the National Bureau of Statistics.